You can see in my video below EXACTLY how I put this together! VERY EASY to mass produce! 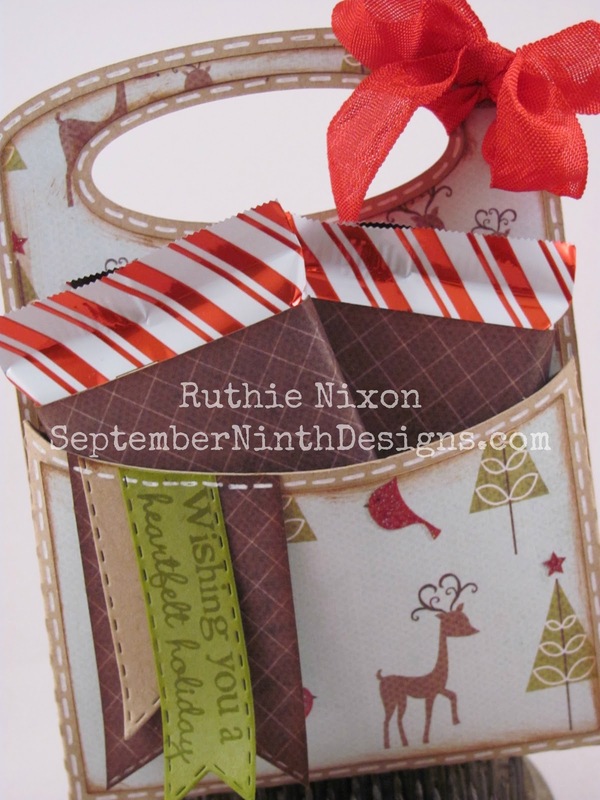 I decided that these are going to be my Christmas tags this year! If you missed our 10th day, go HERE! Love your tag today! I have enjoyed seeing what everyone comes up with,great projects!! Cute tag today. All the tags are fabulous. Great giveaway. Super cute tag! Love the tinsel glitter you used on NO...it makes it pop out. Your tags are so cute gosh you amaze me how you come up with just everything for the completed look they are just awesome I just love everything about them and must lucky people who get a pkg with one on it....and they'll have a keepsake from Emma how special is that a gift on a gift. Oops! Forgot to leave my contact info above. Some great tags ideas here - I need to get busy and make some! HI Love your tag will be sad to see this end. Awesome tags!!! Love the details you put on that santa suit!! I can't believe tomorrow is the last day, BOO HOO!! What a pretty gift tag. I like the clothes line. It adds a cute touch. This DT ROCKS! There is so much talent and creativity here. Thanks for sharing all these inspiring projects. Emma, Once again SUPER project! All of you have done a Fabulous job, I am sad it ends tomorrow! Lots of great ideas and I plan on doing my own take on a few of them next year, I am missing a few of the dies and stamp sets so I will be purchasing those for next year! Thank you for sharing the wonderful ideas and those of your Design Team members! Can't wait to see the final project, thank you again! Aww, your little tag is so adorable, Emma! Love that little clothesline!!! Such a great tag...I love all the details and all the sparkle. You've outdone yourself again today! slbuller at fullchannel dot net. Another adorable tag...can't wait for the next project!!! That is a gorgeous tag! Also gorgeous projects by your design team. Very cute tag! Love how you glittered up the Santa coat and then hung it. Thanks for this fun 12 days and for the chance to win! Another fun and fabulous tag!!! LOVE the sparkle and the ribbon on the top!!! I can't believe we're on Day 11!! So much inspiration; so many ideas; so many gorgeous projects. I want to re-create some of these in the next few days, so I hope 'scraplifting' is okay (please????). Wish you had a Day 13 and Day 14 and Day 15....Thank you for all the sharing! Yes ma'am! ;) & you are welcome my friend! Wow, this has been so much fun seeing what all of you create. Thanks for doing this Emma. I love your beautiful tags. I think next year I will need to start making Christmas projects in August. So many great ideas, so little time left until Christmas! What a fun fun tag!! I LOVE the clothes line, the chunky glitter and the great papers!!! Another awesome project Emma!! So sad tomorrow is day 12....wow how fast thet flew by! I am so enjoying all your projects Thanks so much. Beautiful tags Emma! Very creative DT projects! Thank you for sharing! Super cute tag! I make my gift tags too but they are not as elaborate!! I would have to start making them in January if I did them all this cute!! Totally cute tag!! I LOVE the ribbon!!! I'll have to ask Santa for a spool of that!! Your tag is so adorable! I love the clothesline and the sparkle. Wow Emma, I can't belive is only one day left, thanks for the video and all the awesome ideas, your DT is doing a great job. your tag today is adorable. tfs. Love these tags and projects! 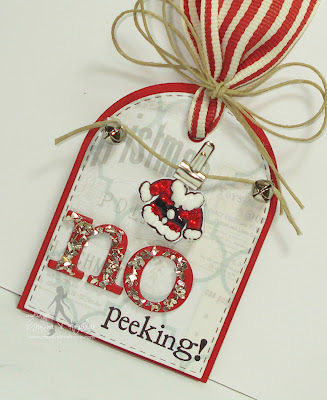 Such a fun no peeking tag. Your dies are wonderful and very versatile! I love this tag and there is that wonderful Melissa Francis Glass Glitter again. That has to find its' way into my stocking somehow too!!! Super cute tag. I need to get me a liquid applique the effect looks so awesome. Love the tag and the sparkle!! DT projects are fabulous as usual, thanks for the inspiration! Your tag is just too too cute! I must get me some liquid applique!! Love ALL of your videos! This tag is precious Thanks for reminding me to order the All Around Christmas! I had forgotten! can't wait to get it! Love your sparkely Tag! !Such adorable DT projects!! Just a darling tag, Emma....and I love all the other posted tags ....this is a great post and appreciate all the inspiration your team gives! Thanks! lOVE the tags Emma. Beautiful job once again. Loving all the fantastic ideas today!! Thank you for all the wonderful inspirations!! I am such a fan of you and your design team! I am always just so impressed with the thing you all create! Thank goodness your shipping is so quick! Just love this die set. They make for easy mass production. Sweet Christmas tag and you have Kim's favorite ribbon too. So fun seeing what you and your wonderful Design Team come up with for your projects. Great job everyone! This tag is just to cute!! Your family is going to love them!! These are so super cute and look super easy to mass produce. Thanks so much for the great ideas!! I have had so much fun, I hats to see this end tomorrow. This may sound crazy...but I think this is the cutest thing I've seen on the 12 days of Christmas so far!! Very cute--I like your use of liquid applique and the glitter. Umm.. These are darling! Fab inspiration!!!! I am loving the Joy blocks and your tag Emma! Cute tag! The little Santa jacket is adorable. Thanks for sharing. Super Cute Projects!!! Love all the ideas!!! I love the tags. You are so creative. Thanks for sharing your ideas. These projects are great. TFS. Are the projects today are great...TFS! Tag is sooo cute and do-able. The other projects looks great!! TFS. Adorable! TFS your tag with all of us. Santa suit is the best! Seeing this reminded me to use my "jingle bells" that I forgot to use last year. Thank you for the great ideas. Your tag is adorable. Then again everything you do is just wonderful. Like I said on Facebook, "love it". This is the cutest tag ever! I love what you did with the Santa suit, love the sparkle! This tag is so cute! I love the jacket on the clothesline and the word no. Have really enjoyed the 12 days of Christmas! What an adorable tag! I love all this inspiration from you and your DT, so fun and creative! but I will, Thank you for Sharing your beautiful projects. .... Oh and just a note In the Close to my heart Catalog Idea book you can get the Liquid Appliqué page 134 and it is for $3.95. cool tag! !loving this..thanks for doing it!! Cute tag, love the die, it's a must have! I love this tag! SO CUTE!!! This tag is so adorable. Love the way the santa suit catches your eyes. The DT as usual did a fantastic job. Thanks for the inspiration and the chance to win. What an adorable tag. Thanks for sharing all your talent. I really need to get my hands on some of your products! You and your design team do such amazing work! TFS! 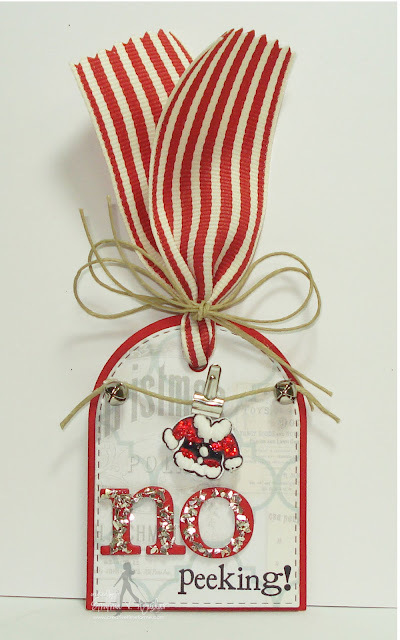 Love the little santa suit on this adorable tag. Thanks for sharing. Cute, cute, cute tags! In addition to my growing inspiration, my crafting wish list is expanding by the project! Thanks?! Cute tags and projects.You and your design team do such great work! What adorable tags. They are pretty enough to hang on the tree for ornaments. I looked in the StampinUp catalog and they don't carry library clips or the ribbon anymore. Sad! Love the beuatiful simplicity of Nikki's card! Your tag is so cute with sweet little Santa coat. Just gorgeous. Love these projects. So beautiful love the ribbon and the cute little saying. Haha I'd be sure to peek if I got this. All your projects are so cool and so detailed, you do such wonderful work. Love love love the tags!!! And that little elf, this is the first year I have heard of him/her and I've seen some pretty creative ideas. Emma ~ Look how FLIPPIN CUTE your tag turned out! Oh my!! 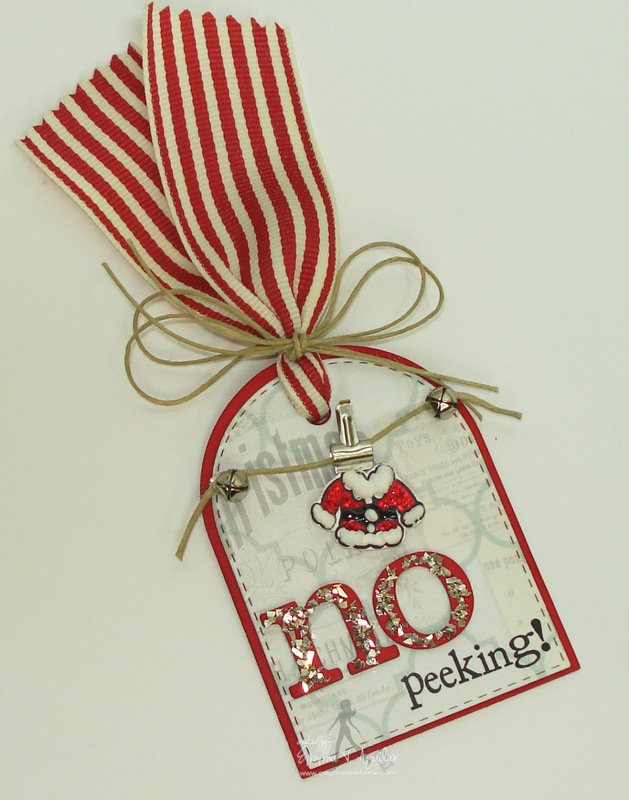 I LOVE the puffiness ~ the sparkle with the gliter ( so CUTE and CLEVEr to have that little Santa jacket hanging on a clothes line) and of course the die and sentiment!! ADORABLE!!! WOW!! I am laughing because we used the same SU ribbon! Sadly the discontinued it ~ it is my FAVORITE ribbbon ever! Yet another AMAZING project and let me say ~ it may I am LOVING the videos!!! Supet easy tag. I like the glitter on the font, this look very elegant. The designer team make a great ideas. Thanks for share. Wow you and your team did great today. Always making super duper sure tags. Soooo cute! I love that sants coat stamp! Thanks for everything! Lovely. Thanks for doing this. Super cute tags and projects by everyone.